Moose Tracks: 70% of your Taxes Are Stolen! Private property under the Constitution in the days of limited government meant that what you earned was YOURS! YOU! decided how it was spent! There is a GIANT moral difference between you deciding to give part of your money to some person, group or organization, and me coming over, taking that money at gunpoint and giving to them. The fact that I pay a third party (the government) a percentage of your money to execute the transfer makes no change at all in the moral calculus. Mandatory "charity" is NOT charity! The person doing the GIVING (taxes are NOT "giving") has the right to decide if smart phones, dinners out, flat screen TVs, etc are worthy items for the recipient of the charity to use the funds on! 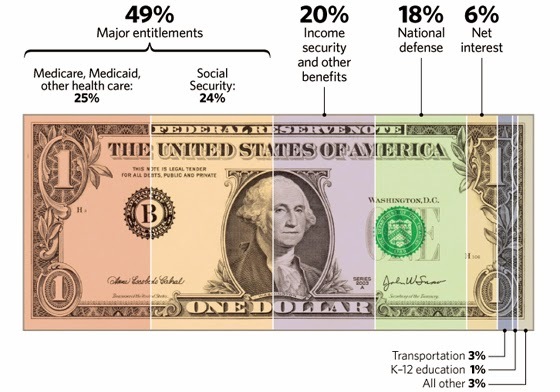 A quick look at that dollar tells us that defense spending is definitely too high! There isn't anything left to defend! The nation is a giant corrupt mess where 20% of the people are paying 90% of the taxes and their money is being used to buy votes from over 50% of the population! If anyone ought to be paying for our defense, it ought to be the Chinese -- they own our debt, they have a vested interest in there being enough productivity left for our decedents to work for a few generations to pay them off! God, Gold, Guns and Gardens -- get out of anything approaching an urban center and work to get less than 50% of your assets exposed to bonds, government and wall street.